After the relative success of our last family ski trip (chronicled in Ski Learning Curve) I was optimistic for our final trip of the season. We were heading up to Tahoe with a good group of folks and would be back to familiar territory (i.e., the Tahoe Donner Ski Resort). The weather would be great, even if the snow wasn't. In the end, some things exceeded expectations (the cabin, the food and the friends were great, and both kids had breakthroughs skiing). Other things were a bummer (my son refused to sleep either Friday or Saturday nights, and I got wretchedly sick). On the balance though, I will count it as a win. After a few fun warm up runs with me on Saturday morning my daughter headed out for a lesson with her ski constructor or ski construction worker, as she alternately referred to him. Little chatty cathy went straight to the top of the mountain with him and skied down without an issue multiple times. The prior weekend she had perfected the barrel straight down the hill mode of skiing, but this time she actually seemed to gain control of her skis and was doing big looping S-turns down the mountain. After her lesson, she and her dad decided to do a few runs together. Emboldened by her new-found prowess, she confidently told her dad that she was ready to head down one of the steeper, intermediate runs. At this point I should note that my husband, who is a very competent snowboarder, was escorting her while attempting to telemark ski for the second time (and probably 5th run) of his life. Needless to say, after a couple of crashes (hers), and an attempt to ski together that resulted in them going backwards in tandem down the hill, they decided to abort the mission and scoot on their butts down the steepest section. To his credit, my husband kept the whole crap,we are in over our heads experience a seemingly fun adventure and my daughter finished up the run relatively unfazed. She skied until the lifts closed that day, and was ready to go again the next morning. All in all, she skied at least twice as many runs as anybody else from our group last weekend and would have done more, if we hadn't left when we did on Sunday. The rest of us are done skiing for the season, but next week my daughter is spending part of her spring break on a ski trip with her grandparents. She cannot wait! 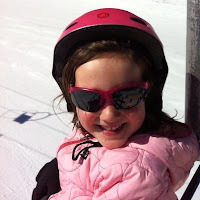 As she sang on the car on the way to school yesterday morning "Skiing down the mountain is so fun, is so fun. Skiing down the mountain is so fun..."
Now about the little guy. Unfortunately, my son came down with a pretty bad cold on Thursday, which meant that he slept poorly for multiple nights, and then was rather out of sorts during the day. As such, he wasn't as keen to ski as he had been the prior weekend. All that being said, on Saturday afternoon he did point to the ski hill and say "up" and vigorously nod his head when he was offered the option of going up the magic carpet. So up we went and we had about three pretty successful runs down. Being fiercely independent, my son did not really like the fact that I held him while we skied down, but he also didn't particularly like it when I did let go of him and he crashed. We negotiated somewhat of a compromise when I put him in the Lucky Bums Harness, but we apparently have a ways to go before he happily accepts it as a condition of being able to go skiing. I was bummed that the poor little guy wasn't feeling well, and didn't seem to enjoy skiing as much as he had previously, but I am sure that there will be more fun ahead next season. Both mornings it took us at least 2-3 hours to get ready, drive to the mountain, schlep four bags, four sets of skis/boots/poles and a stroller up to the lodge, have a snack, get the kids and ourselves in our gear, and then finally trudge over to the chair lifts to "ski" the magic carpet/bunny slope. All this prep work happened just in time to stop for lunch and have the baby need to take a nap. Sigh. "I am not sure that the work to ski ratio is really working out in our favor today"
"I almost pulled my hair out getting ready to come here"
"The way I think about it is - this is me putting in my time. In a few years, this will all be worth it"
"You guys only did two runs? You have been gone forever"
"Nobody in my family listens to me if I try to teach them anything"
"Oh no, there are no turns happening for me today"
It is all totally worth it. Even when your kid downs her hot chocolate reward too fast and throws it up all over the car twenty minutes into the drive home. Seriously though, I think it is.